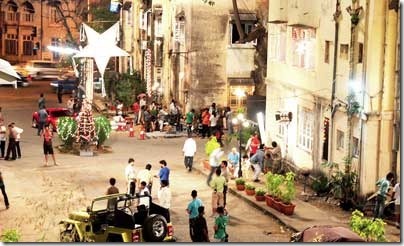 Nowadays, if you drive by Pedder Road at night, you will be mistaken if you think residents of the well-known Khareghat Colony are celebrating an early Christmas and New Year. The big, bright star and huge lights that you see put up all around are not heralding the upcoming festival, but are in place for the shooting of Vidhu Vinod Chopra’s film. The residents, however, say they are being put through a nightmare, and are rather upset with the shooting that lasts the night through. So much so, they have filed a complaint with the local police and the joint commissioner too. “For the past four nights we have been facing a lot of problems. There are very bright lights outside our houses, and the sound of cranes, generators, etc disturb us a lot. We find it difficult to sleep the whole night,“ said a resident who requested anonymity. Kotwal added that elderly and senior citizens of the colony also fear any crime taking place, what with so many strangers rooming around. Another grouse of the residents is that their entry to parking spaces within the colony is blocked at night while shooting is in progress. “Never mind vehicles, residents themselves hardly have any space to enter and exit the premises,” said another resident. Also, during the first two days of shooting, crew members had kept a portable toilet at the rear of the colony and also littered the place with plastic cups, empty food packets, etc, much to the dismay of the residents. On Saturday night, when this reporter visited the spot, Boman Irani and Sharman Joshi were shooting a sequence while driving around the colony in a red Ferrari. The noise of the vehicle added to the din, shattering the calm and quiet of the colony. Kotwal said that the Bombay Parsi Panchayat (BPP) must ensure the welfare of the community and not encourage commercialisation, but the BPP is giving out the premises for shooting purposes, thereby inconveniencing residents. “I can understand if the shooting is done during the day. But continuing the shooting till the wee hours is an absolutely nuisance,” he said. Despite several attempts, Dinshaw Mehta, chairman, BPP, could not be contacted as his mobile was switched off.